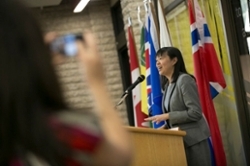 SASKATOON — The University of Saskatchewan’s International Centre for Northern Governance and Development (ICNGD), an affiliate of the Johnson-Shoyama Graduate School of Public Policy (JSGS), has co-launched the first joint international master’s degree in Governance and Entrepreneurship in Northern and Indigenous areas (GENI), with its partner The Arctic University of Norway (UiT). The ICNGD has also received $775,000, plus in-kind travel support from Cameco Corporation for continued funding of its graduate programs. A portion of this investment, designed to further northern research, will provide scholarships and travel for 12 graduate students per year for five years. This funding will be available to students enrolled in the new GENI program, as well as those enrolled in the centre’s existing Master of Northern Governance and Development (MNGD) program. The first intake of students for the new GENI program began this September. Established in 2009, the ICNGD enhances the capacity of Saskatchewan’s northern communities through northern-tailored education programs and an extensive community-applied research program. Currently, its research and outreach activities focus on northern governance, health and social development, innovation, entrepreneurship and economic development, capacity building, as well as resource development and environmental management in northern Saskatchewan, the provincial norths and the circumpolar north. 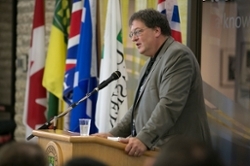 “The GENI and MNGD programs provide graduates with a better understanding of the current and future challenges of the north, and how best to resolve them in ways that strengthen the position of the communities and people of the region,” said Ken Coates, ICNGD director and JSGS professor at the U of S.
As one of ICNGD’s highly valued partners, Cameco has an impressive record based on long-standing partnerships with northern communities. Cameco’s continued investment in the centre’s graduate programs ensures that Canadian businesses that rely on northern Saskatchewan resources will continue to receive expert advice on governance and environment, health, social and resource development. Since the MNGD program was launched in 2009, more than 50 graduate students have benefitted from the support provided largely by Cameco. It is the largest and most comprehensive program in Canada that focuses on the provincial north. Both the GENI and MNGD programs include an international component where students travel to Norway to gain insight into the governance and development challenges and opportunities encountered in other circumpolar regions.